Why is Providing Trauma-Informed Yoga Key to BKY’s Mission? The Dalai Lama once said, “Love and compassion are not luxuries, they are necessities. Without them humanity cannot survive.” So often, those of us that live in stable, safe homes take for granted the love and compassion that we have received throughout childhood. Living amongst supportive family and friends has allowed us to survive and thrive. But for those living within the cycle of abuse and violence, the absence of these and other basic necessities may have dramatic consequences for the individual, the community, and greater society. In our last post, What is Trauma-Informed Yoga? , we provided a common understanding of trauma-informed yoga, an introduction to the current research on its benefits, and why it’s so urgently needed in our community. It is with this understanding that volunteers with Bliss Kid Yoga, who are dedicated to providing both accessible, nurturing yoga programs for children, families and educators in Austin, piloted a partner program to bring yoga to those currently housed at the SAFE Austin Children’s and Family Shelter campuses. Residents include children, young adults and families affected by abuse, exploitation and neglect. Individuals and families reside at SAFE for short, transitional or long-term support. In addition to the inherent difficulties of navigating adolescence, residents present with an array of needs related to the exposure to trauma. As a result of complex trauma, individuals are likely to demonstrate an decreased ability to self-soothe, hypervigilance, and hyperarousal of the central nervous system. Even in a yoga-saturated city like Austin, BKY members noticed a void when it came to trauma-informed services. Our volunteers range in experience from seasoned yoga adult and children’s instructors, K-12 educators, and parents. 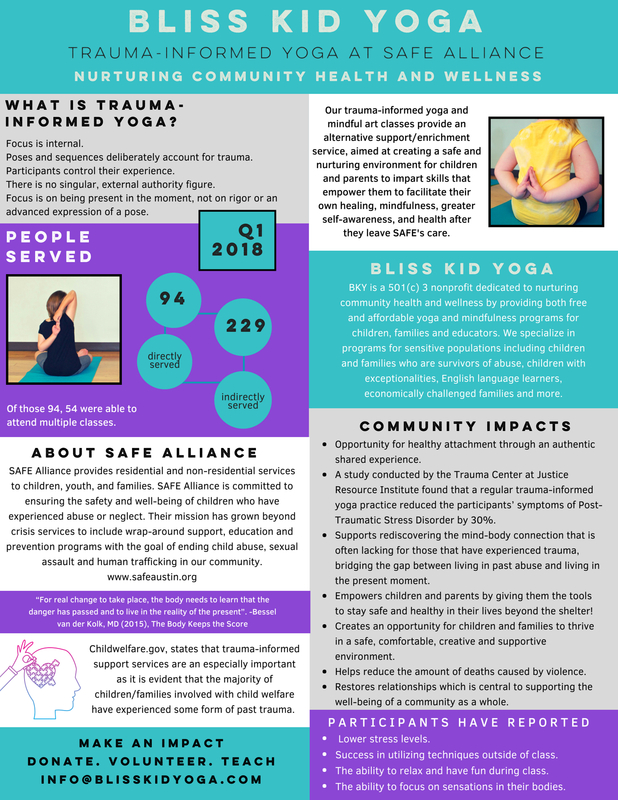 While we are by no means experts in the field of trauma-informed yoga, our dedicated team is seeking to address this void through a pilot program at SAFE, as well as continued personal and professional development. Our team of tenacious Bliss Kid volunteers are building a foundation for an inclusive, supported space for SAFE residents to explore, heal, and frankly, just breathe. Our ninety minute classes include asana and movement, meditation/relaxation, and mindful art exercises or activities. This core group of dedicated, consistent volunteers provide a low student teacher ratio, appropriate for modeling and encouragement during the practice. This project speaks to the core of BKY’s mission of empowering Austin residents through access to yoga. Classes offer tools for these young people to stand firmer in their sense of self, while experiencing a love and compassion that may not have been afforded before. We hope that you will consider contributing, to promote the sustainability and expansion of this potent program. donations of yoga props, such as bolsters, blocks, mats, eye pillows, etc. your offering of creative ideas on additional ways to help! Please feel free to ask questions, provide feedback or comments below. If you wish to reach out to us privately email, info@blisskidyoga.org.